Dun Laoghaire harbour. 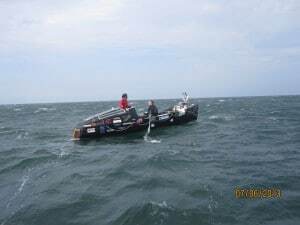 Just a quick update..
We stopped in at Dublin late last night (12th June), we actually got in around 0030 and as we came into Dublin bay a yacht was creeping towards us, head to head. We shone the torch over to get their attention and they changed course to our port side, as they got closer we heard a voice shout “Savoir Faire!” .. A little confused we replied “Yes?” .. Turns out it’s a couple that have been following the race and made a special trip out to see us in the early hours of the morning! They then followed us slowly (3 knots) in to anchor, had a quick chat and they moved on. Mick and Niamh, lovely couple! 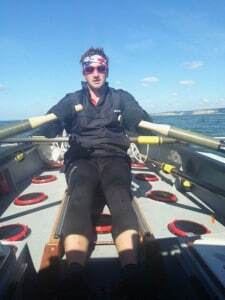 Mick is a marshall for the Irish Sea row crossing races. We anchored within a harbour wall, really calm, good night’s sleep to wait for this storm to roll through. We woke up at around 11am to a little hustle ‘n’ bustle? Poked my head out the hatch and had about 30 little sailing boats playing around us! We spoke to the instructors and waved to the kids, still a little dazed from waking up, hair everywhere, make up from the night before, y’know. The rest of the day was spent on trivial things, trying to keep entertained whilst the westerly blows through, we watched “Pumping Iron”, check it out, it’s not gay. Everyone is really friendly in Dun Laoghaire, lots of people slowly passing the boat and asking questions. As I write this, I notice the local rowing club have started following us on twitter! Itching to get back out on the oars we weren’t sure what time to head out? The wind forecast said 10pm, the tides said 8.30pm, we ended up leaving at 9.30pm and all’s good so far! It’s calm, nice bit of tide behind us and we’re well rested so should be able to potter up to Dundalk bay about 30 miles or so away, then we need to assess the conditions before creeping up to Belfast because there’s mention of force 6 to 8 coming through tomorrow!